Thousands of people took part in pro and anti-government protests across Egypt on Friday. Thousands of people took part in pro and anti-government protests across Egypt on Friday, reports Al Arabiya. 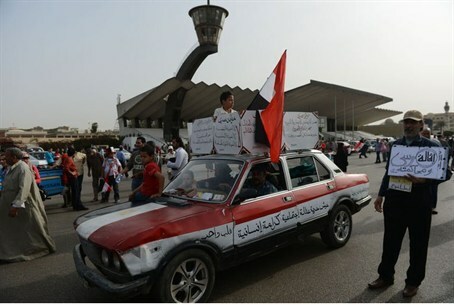 The protests that took place after Friday’s prayer saw thousands take to the streets in Cairo, Giza, Alexandria and other cities around the county, according to the network. Anti-Coup Alliance protesters, who demand the reinstatement of President Mohammed Morsi, were shouting slogans against army chief General Abdel Fattah al-Sisi, who ousted Morsi on July 3 after mass protests. Supporters of Sisi gathered in Alexandria to show their support for the general, holding posters of him and chanting national songs, reported Al Arabiya. In Suez, police fired tear gas to disperse around 4,000 pro-Morsi demonstrators, a local witness told Reuters. In Cairo’s Giza neighborhood, residents threw stones at a group of Brotherhood demonstrators who were chanting against the army, leaving seven people injured. Local media reported that there was no police presence in the Giza district at the beginning of the clashes that erupted between pro- and anti-Morsi protesters. In Alexandria, about 1,000 demonstrators backing Morsi and his Muslim Brotherhood blocked the main road along the Mediterranean seafront, a witness told Reuters. Security forces have locked down areas of central Cairo ahead of planned pro-Muslim Brotherhood marches, closing down main squares including Tahrir, Rabaa al-Adaweya and al-Nahda. Egypt has witnessed protests and clashes that have left scores dead since Morsi’s ouster. Morsi, who has been held at an unknown location since being ousted, has been charged in the killing of protesters outside his palace in December 2012. His trial is scheduled to begin on November 4, and the Anti-Coup Alliance has already called for mass protests during the trial.